Reflecting on two decades of communications lifecycle management software and customer-focused services. Nobody called it ‘cloud’ back then. That term wasn’t popularized for at least another decade. Instead we used phrases like hosted, or Application Service Provider (ASP). Of course, for me, it was as much about the service as the applications. Comview Corporation, a leading provider of fixed/mobile telecom expense management (TEM), call accounting and related software and services, has just passed an important milestone in the company’s history. This November marks two decades of Communications Lifecycle Management software and service built on top of a “Customer for Life” philosophy. The seeds of Comview were planted before 1997 when Comview CEO and Founder, John Perri, was contemplating the next chapter of his life, and what would be the next big idea, after selling his previous call accounting company. Up to that point, call accounting relied on on-premise, PC-based technologies. However, John saw potential in this fairly new thing called the Internet to build a better mousetrap. It was then that he set out to create the first cloud-based Call Accounting platform. 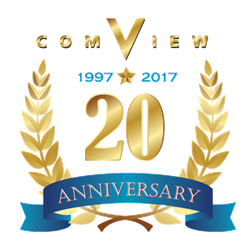 And so, in November of 1997, Comview was born. Over the years it grew to encompass Communications Lifecycle Management with fixed/mobile telecom expense management, IT asset management and a host of related services on a single platform. Serving customers well has been the rock and foundation of the company since inception. Comview is driven by a top-down “Customer for Life” philosophy that permeates every facet of its culture. Every employee is keenly aware of it. In fact, “Going the extra mile is one of the things we’re best known for, and for which I am most proud,” Perri shared. “That isn’t going to change anytime soon!” Customer retention and third-party surveys have validated that the philosophy is working. In fact, Comview still has many of its original customers. Integrated Telecom Management technology is Comview’s other hallmark of the past 20 years. The company’s modular software was architected from the ground up to be a flexible, single platform. This has distinct advantages for customers. They only have one portal to deal with regardless of which combination of telecom expense management, mobility management, call accounting (or whatever) they use. Plus, the cloud model ensures clients never have to worry about performing upgrades or back-ups, since they always have the latest version.